Taekwon Kid is one of the new Expanded Character Classes. The Taekwon Kid practices the martial art of Taekwon Do, a style which uses kicks to attack. Because of this, taekwon kid cannot equip any weapons, and must rely on thier own strength to do damage. Any novice can become a Taekwon Kid once they reach job 10, by applying at the job change NPC in the City of Payon. 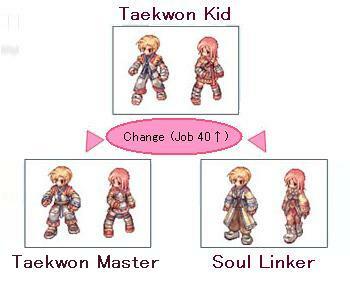 Taekwon characters follow the same exp curve as regular classes, and can change to second class at job level 40, though they can continue up to job 50 if they so chose. A Taekwon Kid may elect to class change to either a Taekwon Master, or Star Knight. A Taekwon Master is a Taekwon user who is in tune with the celestial bodies, and uses the power and knowledge of books to power his attacks. A Soul Linker is a mage like spiritualist who aids others by blessing them with new skills and abilities. A third option exists. A Taekwon Kid may chose not to class change, and instead through the use of the skill Taekwon Mission, attempt to become one of the top 10 Taekwon Kids. These top 10 ranked players gain extra stats and abilities, which makes it a worthy prospect. SP Cost: Depends on skill level. Cast Time: Depends on skill level. 0.5s aftercast delay for all levels. Description: Enable the caster to run with incredible speed. At levels 7 and above, this skill endows the caster with the Spurt status, which will temporarily increase STR if the caster stops running and is bare handed, but is canceled once the caster equips a weapon. Cast Time: Depends on skill level. No aftercast delay. Description: Leap uses the Taekwon's leg strength to perform a great jump, leaping over obstacles and hazards on the way. When you activate Leap, you will jump forward a certain amount of cells depending on the skill used. There is no restrictions, as long as the target cell is a valid walkable cell and not currently occupied by another player, the jump will succeed. If the target isn't valid, your character will simply stay in its original spot. The Leap skill is usable on all maps, including WoE and PvP. Description: Peaceful Break is a passive skill which activates when ever you sit next to another Taekwon class character. Once it activates, you will regenerate HP quickly over time. The base recovery rate of Peaceful Break increases as you have higher Vit. You can gain an additional +30 HP recovery on the next regen interval by using /doridori emote while its active. This skill will not work over 50% weight. Description: Happy Break, like Peaceful Break is a passive skill which activates when ever you sit next to another Taekwon class character. Once it activates, you will regenerate SP quickly over time. The base recovery rate of Happy Break increases as you have higher Vit. You can gain an additional +3 SP recovery on the next regen interval by using /doridori emote while its active. When two Taekwon players under the influence of Happy Break use /doridori, they both gain the "Happiness" status. An icon will show on the right side which resembles gloria, and for 30 minutes you will be able to use an Earth Spike Scroll with a high probability of it not being consumed durring the cast. Casting earth spike this way will consume 10sp. The chance of the scroll actually being consumed is 10% at level 1, 1% at level 10. Description: Kihop increases your attack power by a percentage based on the number of people in your party that are currently on the map with you. Kihop affects all regular attacks, and stacks with, but does not multiply damage from skills (ie: if fighting chant gives you a 50% attack bonus and you do an attack skill that deals 300% attack, the total damage will be 350%). Cast Time: No cast time, no aftercast delay. Description: Mild Wind allows the Taekwon character to change his weapon element on the fly to what ever is appropriate to the situation. The level of the skill determines what element you will change your attack to. Mild Wind is instant casting, and with the sole exception of holy element endow, mild wind will not cancel if you change weapons. Description: Tornado Stance is a stance skill. Like all the stance skills, Tornado Stance is a skill which you can activate or deactivate at any time and has no immediate effect. When Tornado Stance is active, while attacking there is a 15% chance with each hit that your character will stop attacking and will say "Tornado Stance!!" above his head. This delay lasts for 2 seconds, and durring this time you may chose to use the skill Tornado Kick. It is possible to have multiple stances prepared. If you class change to Soul Linker, you will be unable to activate any stances. Cast Time: Instant cast, no delay. Description: When you activate Tornado Kick, your character will do a spinning kick which damages all monsters in a 5 x 5 area around you. Tornado kick is a Taekwon Kick skill, and can only be activated after the skill effect of Tornado Stance triggers. If you class change to Soul Linker, you will be unable to activate this skill. Description: Heel Drop Stance is a stance skill. Like all the stance skills, Heel Drop Stance is a skill which you can activate or deactivate at any time and has no immediate effect. When Heel Drop Stance is active, while attacking there is a 15% chance with each hit that your character will stop attacking and will say "Heel Drop Stance!!" above his head. This delay lasts for 2 seconds, and durring this time you may chose to use the skill Heel Drop. Description: When you activate Heel Drop, your character will strike the target opponent hard with the heel of your foot. Heel Drop has a high chance to cause stun for three seconds when it hits. Heel Drop is a Taekwon Kick skill, and can only be activated after the skill effect of Heel Drop Stance triggers. If you class change to Soul Linker, you will be unable to activate this skill. Description: Roundhouse Stance is a stance skill. Like all the stance skills, Roundhouse Stance is a skill which you can activate or deactivate at any time and has no immediate effect. When Roundhouse Stance is active, while attacking there is a 15% chance with each hit that your character will stop attacking and will say "Roundhouse Stance!!" above his head. This delay lasts for 2 seconds, and durring this time you may chose to use the skill Roundhouse. Description: When you activate Roundhouse, you do a circular kick that does great damage on one target and sends the rest of your opponents flying. When roundhouse is used, all monsters in a 3 x 3 area around the targeted enemy are knocked back. Roundhouse is a Taekwon Kick skill, and can only be activated after the skill effect of Roundhouse Kick Stance triggers. If you class change to Soul Linker, you will be unable to activate this skill. Description: Counter Kick Stance is a stance skill. Like all the stance skills, Counter Kick Stance is a skill which you can activate or deactivate at any time and has no immediate effect. Counter Kick differs from other kicks that when it is active, there is a 20% chance that the kick will activate while attacking. The delay lasts for 2 seconds, and durring this time you may chose to use the skill Counter Kick. Description: When you activate Counter Kick, you take the opponents motion and turn it back against him, dealing a strong blow. Because of the nature of the attack, counter kick cannot be dodged. Counter kick is a Taekwon Kick skill, and can only be activated after the skill effect of Counter Kick Stance triggers. If you class change to Soul Linker, you will be unable to activate this skill. Description: Tumbling is similar to other stance skills, but unlike other stances breakfall activates only when taking ranged damage. When Tumbling triggers, you will fully dodge the attack. While there is no delay associated with this skill like there is with other stances, but after Tumbling activates to dodge an attack you may elect to use Flying Kick to jump instantly to that target and deal bonus damage. If you use Tumbling while in the Spurt state given from the Running skill, Tumbling will actually trigger to block melee attacks as well. It is possible to have multiple stances prepared. Tumbling, unlike most stances is usable as a Soul Linker. However, you will not be able to use it to block melee skills by comboing with Sprint state. Description: Flying Kick is a ranged kick where you leap at an opponent, instantly closing the gap between you. Flying Kick is a targeted attack, and can be used from up to 10 cells away. Flying Kick can also be activated after the stance breakfall triggers. If this happens, you will do bonus damage with your kick, depending on your base level. Also, if you target an opponent with Flying Side Kick while actually running, you will also gain this bonus damage. Flying Kick has a unique property that allows it to break any Spirit type skills granted by a Soul Linker. If your target has any Spirit skills active or bonus attack speed granted by berserk potion pitcher skill, they become dispelled. The Preserve skill protects a target from this dispell. This skill can be plagerised by a Rogue or Stalker. As a kick skill, this is unable to be used by a Soul Linker. Cast Time: 1 second cast time. Description: Taekwon Mission allows a Taekwon character to undertake a special mission to gain ranking as a taekwon. The top 10 ranking taekwon characters get special bonuses. The first time you activate Taekwon Mission, the target you are currently fighting will be declared as a mission target. In order to get a taekwon point, you will have to kill 100 of that kind of monster (not necessarially in a row). Once you complete your 100 kills, you will gain one point and be randomly assigned a new target. If you ever find the choice of target to be unfair, if you have 0 kills towards the current mission there is a low chance that when using Taekwon Mission again will assign you to a new target. Being one of the Taekwon characters with the top 10 points is very worthwhile. 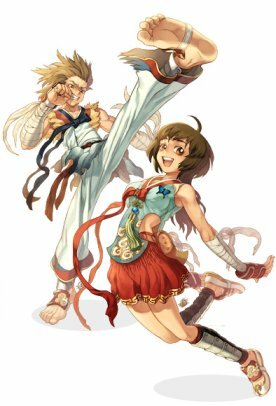 When you become a Taekwon ranker, you will be able to use any kick skill without waiting for the stance to activate. In effect, you have unlimited usage of your kicks. Also, if you are level 90 or higher, you gain three times your max hp and sp. You however will lose the bonus if you are bumped off the top 10. You can check the top 10 ranking by using /taekwon in the RO client. Taekwon Mission is available only to Taekwon Kid characters. If you class change to Soul Linker or Taekwon Master, you will lose your existing points/rank and be unable to use Taekwon Mission anymore.